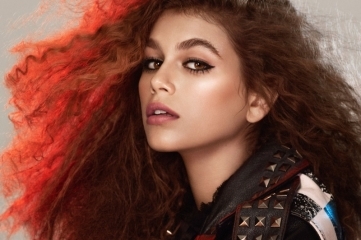 Kaia Gerber (daughter of Cindy Crawford + Rande Gerber) landed her first beauty campaign as the new face of Marc Jacobs Beauty. The ’80s inspired campaign was shot by David Sims, video was directed by Hype Williams and styled by Katie Grand, featuring Gerber with dramatic crimped hair, wearing an awesome leopard bomber and Marc Jacobs Beauty’s newest product, a Highliner Matte Gel Eye Crayon. Check out the video above and more shots of #MJBxKAIA in our photo gallery.